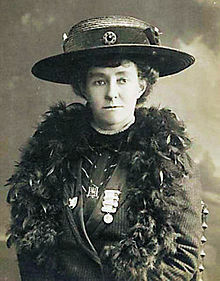 Emily Wilding Davison was a suffragette who fought for women’s suffrage in the United Kingdom in the early twentieth century. She was known for extreme tactics that resulted in her arrest on nine different occasions. She protested by means of hunger strikes, and was force-fed 49 times whilst in prison. The hunger strike was a common tactic among suffragettes as was force-feeding by British penal authorities in response. In her most famous moment of protest, Davison stepped in front of King George V‘s horse Anmer at the Epsom Derby on 4th June 1913 and suffered injuries that proved fatal four days later. Her funeral on 14th June 1913 was organised by the Women’s Social and Political Union (WSPU). Thousands of suffragettes accompanied the coffin and tens of thousands of people lined the streets of London. Today, June 8th, marks 104 years since she died .